In our ongoing mission to develop a learning system that provides everything every language learner needs in one system, we are proud to present the latest and most feature-robust evolution of Mango learning. The team at Mango has been hard at work creating a fully enhanced learning environment that builds new language skills, thoughtfully reinforces learned material, and presents content in contexts that are carefully crafted by linguists and built by developers who live the same passion for language and culture that you do. 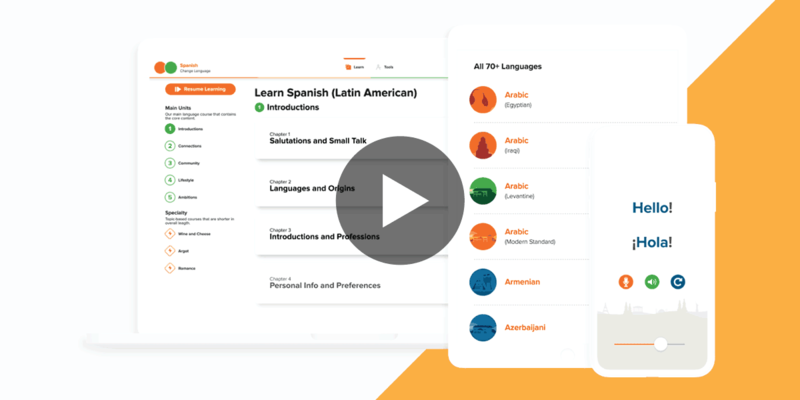 This exciting evolution of Mango presents a truly holistic learning experience, equipped with what you need to express yourself with confidence, and is responsive to your unique learning habits — allowing you to create your own personalized language-learning pathway. Discover some of the update highlights and start exploring for yourself. Driven by our core purpose to enrich lives with language and culture, we’re constantly inspired to make sure your progress through our content means you are confident in your level of communication and cultural IQ, and that you get the most out of your commitment to learning a new language. When you log in, you may find you’re in a slightly different spot from where you left off. Our team of linguists and international instructors worked together to add more content and restructure our most popular language courses. Blended with Mango’s proven methodology, the added course content now aligns with goals and guidelines set by internationally recognized scales of proficiency to achieve a new (Mango) standard of language-learning. Your new position accurately reflects your progression through the Mango system, but if you’d like to see the new content that has been added to lessons, this is a great opportunity to refresh and lock in previously studied material. Scroll through previous chapters to revisit lessons or discover where we’ve highlighted new content. The Mango Proficiency Scale | Universally standardized content removes international barriers and is now more accessible to our global learners, which means anyone who learns with Mango can be confident their language skills measure up on a global scale. The Mango Proficiency Scale maps your learning goals and achievements onto guidelines laid out in the Can-Do statements established by the American Council on the Teaching of Foreign Languages (ACTFL). To make our content more accessible to our global learners who measure their language skills with The Common European Framework of Reference for Languages (CEFR), we’ve created a universal scale of language and culture proficiency that allows learners around the world to set goals and achieve communication skills that meet internationally recognized standards. At the end of each chapter of Units 1 and 2 in our top language courses, you can engage your new skills in different contexts, through Mango’s new Listening & Reading activities. Not only do these activities assess your listening and reading skills, they also introduce you to new vocabulary, preparing you for real-world situations in which you may need to quickly pick up on context clues to navigate unfamiliar conversations, or more effortlessly recall a wider range of vocabulary on specific topics. Listening & Reading Activities challenge your comprehension of learned material through interactive audio and written passages, and assess your understanding via comprehension questions. These new modes of learning provide you with more opportunities to be consistently engaged with new and repeated material, and to more rapidly develop your language intuition skills. Listening Activities | Choose your challenge by previewing the new vocabulary and their meaning in the New Words list, or begin by listening to the passage as a whole, fast-forward, rewind, pause, play, or dissect it line by line, repeating lines as many times as you’d like while you listen for new vocabulary in the context of the conversation. You can also turn the supporting text feature on or off to help build confidence at your own pace. Reading Activities | Similarly, this activity includes interactive vocabulary and allows you to choose your challenge by playing the passage’s optional supporting audio as you read, and provides questions that assess your grasp of the content. Learn as you need to by hovering over unfamiliar words to see their definitions, and click on them for the translation and audio that articulates the word at a slower pace. Review is an essential aspect of language learning — the more you review, the more fluent your conversations in another language will be. However, it can be easy to forget when and what to review. Engineered using Mango’s uniquely crafted spaced repetition algorithm, the Mango Review System offers an intuitive opportunity to commit what you’ve learned to long-term memory. Key words or phrases from each Mango Conversations lesson are automatically added to your review activity, and the frequency in which you may be presented with a given phrase will vary depending on your ability to recall the correct translation, allowing you to decide how confident you feel to move forward. The Mango dashboard will refresh your review stack daily, while your user dashboard will provide you with reminders to revisit that material. This individualized review system adapts to your individual progress and until you feel confident in your comprehension. Navigating through the Mango learning system is now more intuitive than ever. The simplified layout reveals your course activities and additional content available relevant to your target language, all in one place. With direct access to Specialty Courses, you can explore different aspects of the language you’re learning, from business-specific phrases to various cultural interests. Organized to make sure you have everything you need in one place, this simplified layout makes sure you aren’t missing out on any learning opportunities. Check your progress at a glance with access to all of your chapters laid out in one smooth scroll. See how far you’ve come or jump ahead to see what’s coming up next. Your user dashboard will also let you know when you have cards up for review. Seamlessly access the new listening, reading, and review features whether you’re on desktop, iOS, or Android devices. The Mango mobile app provides the same learning experience as the desktop version, and offers Bluetooth and auto play features for continuous and hands-free progression through your Mango lessons. Make sure to visit your app store and download the update directly from the store to create a seamless learning experience across all devices. If you have any questions, visit our FAQs page, or get in touch with our customer support team at support@mangolanguages.com. Make sure to update your app to try it out now and don’t forget to let us know what you think by leaving a review or comment below.